Located on Spain's southern coast on the Mediterranean Sea, the Costa Del Sol is one of continental Europe's most coveted summer and golf holiday destinations, especially for sun-starved Scandinavians and Britons around springtime. It's also earned the nickname, "Costa del Golf." What sets the Costa Del Sol apart from its neighbor and golf destination rival, Portugal's Algarve, is its abundance of off-course activities, from tapas restaurants to historical sights. The spectacular, historic village of Ronda is just an hour's drive into the mountains; or enjoy cultural delights in Malaga or Marbella's Old Town. Though Malaga is the area's largest city, home to over 1 million residents, you'll want to head west along the coastline to find the area's better golf courses. The golf tends to get better and better as you pass through towns like Torremolinos, Marbella, Sotogrande and into San Roque, where golf courses like San Roque Old and Valderrama lie among other upscale designs. Course style varies in the Costa Del Sol, but the majority are set on steep hillsides just a few miles off the coastline and usually offer views of the Mediterranean from at least a few vantage points. Valderrama Golf Club is the area's most famous golf course. Host to the 1997 Ryder Cup Matches, it offers limited public play at 275-300 euros for 18 holes. These green fees are high for the area. In fact, most visitors will be surprised at the variety and value of golf courses and resorts in the Costa Del Sol, where you can easily play for as little as 50-60 euros. For answers to Costa Del Sol FAQs, click here. Sure, the wealthy may arrive by yacht in Puerto Banus, but most visitors to the Costa Del Sol fly into Malaga (AGP). For North American visitors, Malaga does offer non-stop service from New York. However, most long haul visitors connect in Madrid or Barcelona. Another option, if you want to discover the western part of the Costa Del Sol, is to fly into Sevilla, from which you can reach the Costa Del Sol in less than two hours. Generally speaking, the peak seasons for golf are the spring and fall, about mid-March through May and late-September through November. The summer months are hotter but manageable, though the coastline is experiencing its highest tourist season, so accommodations are at a premium and the traffic can be headache inducing. 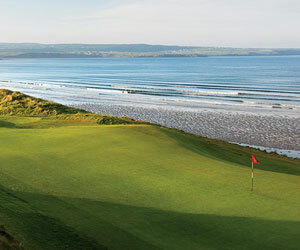 You can golf in the winter here, with average highs 16-17 C (60-62 F) in December and January.